This study examines public apology in the context of the retail industry, specifically the Australian supermarket industry. 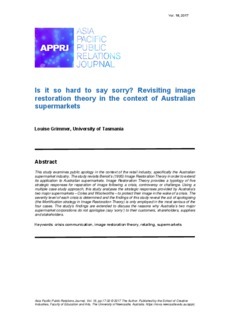 The study revisits Benoit’s (1995) Image Restoration Theory in order to extend its application to Australian supermarkets. Image Restoration Theory provides a typology of five strategic responses for reparation of image following a crisis, controversy or challenge. Using a multiple case study approach, this study analyses the strategic responses provided by Australia’s two major supermarkets – Coles and Woolworths – to protect their image in the wake of a crisis. The severity level of each crisis is determined and the findings of this study reveal the act of apologising (the Mortification strategy in Image Restoration Theory) is only employed in the most serious of the four cases. The study’s findings are extended to discuss the reasons why Australia’s two major supermarket corporations do not apologise (say ‘sorry’) to their customers, shareholders, suppliers and stakeholders.